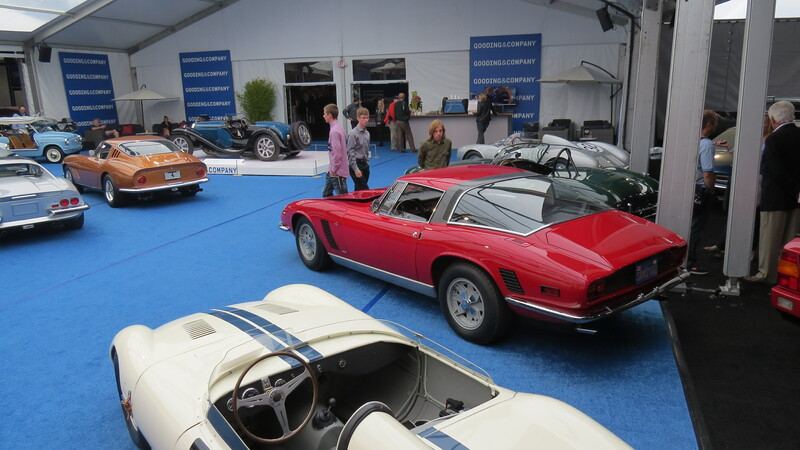 One Long Lost Iso Grifo – Part 5: going to a deserving home. Once the dust had settled it can be stated that THE nicest original Iso Grifo on the planet has found the deserving home I talked about earlier. It was taken to the Gooding auction at Pebble Beach and the buzz was on that this car would make it’s presence there. Justin from Gooding had done a good job of getting the word out and even though this is not a “F-car” there were several very high end buyers present to see where this one ended up. It was presented well at auction and was in good company – the ex-Millner 7Litri was across the room in all it’s (restored) glory. Us insiders know the car and even though it presents beautiful it was not as “original” as Sam’s Series II small block Grifo 369. However, we had no hopes of beating it in a bidding war – our 369 was heading for a whole different clientele. I met Sam at the car and we knew we had done the best we could – this was the moment to find out what the world thinks of an ORIGINAL car. The auction itself was perfectly executed except for the commentator calling the car “Aiso Griffo” – telling me just how unknown these cars still are! The bidding started at $200,000 and flew up to $400,000 within 20 seconds, where it stalled a bit and it ended up being sold at $465,000!! This means with buyer’s commission it ended up setting the record for an unrestored Grifo at $510,000! This was the reward for our hard work; Sam was happy and the car ended up with a good friend who is elated to have it in his collection now. It is among a gorgeous Bizzarrini Strada I found for him, a very unique Iso Grifo Can Am and many other high profile exotics. End good, all good!